Romwe Party Queen Dress Giveaway | Cosa Mi Metto??? So it seems that today's all about giveaway!!! I know you love Romwe as much as I do and so I don't want you to miss this one! 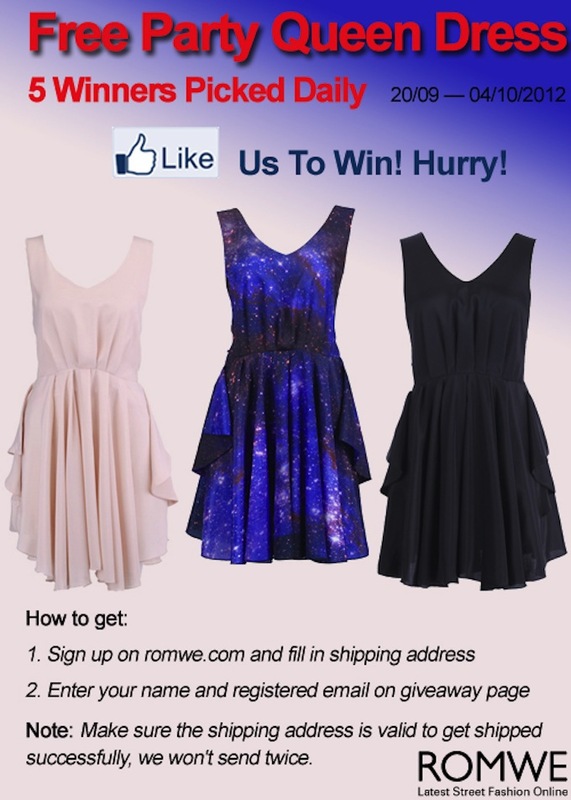 Get the chance to win a party dress from ROMWE facebook. There will be FIVE winner everyday. Valid date: 09/20 - 10/04/2012 and it's worldwide!! Click here to find the rules and join!!! A quanto pare oggi non vi parlerò d'altro che giveaway!!! So che amate Romwe tanto quanto me e quindi non voglio che vi perdiate proprio questo! Avrete la possibilità di vincere uno di questi vestiti di ROMWE su facebook. Ci saranno CINQUE vincitrici ogni giorno. Dal 20/09 al 04/10/2012, aperto a tutto il mondo!! Cliccate qui per trovare le regole e partecipare!!! Great giveaway and I just entered! Lovely dresses. I love he blue colour dress. It has a glitter look that is really eye catching. Hotmail com login being hack, now to prevent these problems you first have to incerase the level of security on the device on which you are using you hotmail Account after that get your computer cleaned up and after that you can use your account on the device, but make sure you turn on two step verification on your Hotmail Account or Outlook Account to increase the security level on the Account.